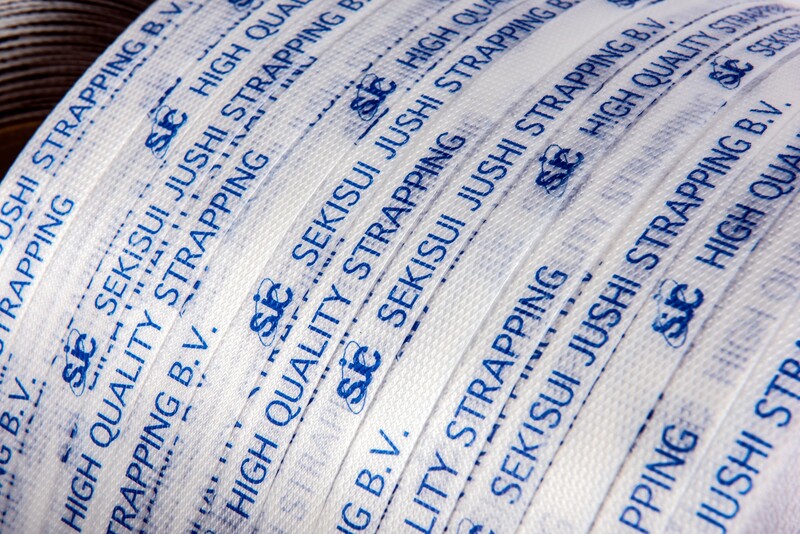 Printed strapping - Sekisui Jushi Strapping B.V.
You can print text and images onto your strapping. Printed Sekisui strapping is highly regarded throughout the world thanks to the high-quality printing and excellent readability. Sekisui Jushi prints both PP and PET strapping. The strapping is also highly effective in boosting the visibility and recognizability of your company, logo, and information. You can print logos, text, and codes on your strapping such as EC approval numbers, product codes, or other data. This saves you a great deal of money on labelling and labour costs (application of extra labels). Sekisui Jushi’s printing technique guarantees durable printing that will not fade over time. The prints can be applied every 5-20 cm. Printed PP strapping is only available for widths of 8 mm or above. You can choose from the following selection of standard printing colours: light blue, dark blue, forest green, red, and black. Upon request, we can also offer custom colours.